Check out of hotel. Luggage collected by Shongololo staff. Transfer to Rovos Rail Station in Pretoria. 14h30: Train departs for Kingswood for our overnight stop. 10h00 Visit the Big Hole and Diamond Mine Museum in Kimberley. 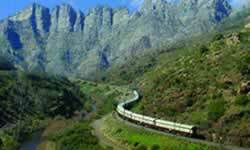 12h30 Return to the train in Kimberley and depart for Upington. Capital of the Northern Cape, Kimberley is well known for the discovery of diamonds which led to its establishment in 1893. Highlights include a visit to the Big Hole Diamond Mine Museum. 09h00 Morning tour of Upington and wine tasting at Belazel Brandy & Wine Cellar. 12h00 The train departs Upington for Nakop for border formalities with Namibia. Overnight Holoog. The train departs from Upington and crosses into Namibia late in the evening. 09h00 Morning visit to the Fish River Canyon, the largest in the southern hemisphere. 12h30 Return to the train and depart for Aus for overnight. The train journeys from Keetmanshop to Aus over night. 09h00 Full-day tour of the ghost town Kolmanskop and Lüderitz, well known for its colonial architecture and wildlife. 18h00 The train departs for Keetmanshoop for overnight. Lüderitz lies at the end of the currently decommissioned railway line to Keetmanshoop. En route we might see the legendary horses that are rumoured to roam the Namib desert as we visit the ghost town of Kolmanskop. Lüderitz is known for its museum, colonial architecture and for wildlife including seals, penguins, flamingos and ostriches. 09h00 Morning tour of Keetmanshoop. See the Giant’s Playground with its 20km-long dolerite dykes as well as Quiver Tree Forest, home to 300 species of the Aloe dichotomy. 13h00 Return to the train and depart for Mariental. 08h00 Transfer to Sossusvlei Lodge in the Namib-Naukluft Park. Visit the Sesriem Canyon, shaped over millions of years by the Tsauchab River. Overnight at lodge. The Tsauchab River has shaped the Sesriem Canyon over millions of years and it is one of the few places in that area that holds water all year round. The early Afrikaans explorers named the canyon after the fact that they had to use six (ses) leather straps (riem) tied together to create a rope long enough to lower water buckets into the canyon below. Enjoy sunrise from Dune 45 followed by brunch at the lodge. Take a scenic drive through the Namib-Naukluft Park. 18h00 The train departs for Rehoboth for overnight. The dunes of the Namib Desert were created by sand carried by the wind from the coast of Namibia. The sand here is 5 million years old and is red in colour due to its iron-oxide content. As the lighting changes with the time of day, so does the appearance of the dunes’ characteristic colour, allowing for interesting photographs at any time. The wind in the Sossusvlei area blows from all directions, which means that the type of the dunes hear are known as “star dunes”. This is because the winds cause the sand to form a star shape with multiple arms. 09h00 City tour of Windhoek. See the Trans-Namib Transport Museum, the Alte Feste (Old Fortress), the Evangelical Lutheran Church – a striking landmark – and the Namibia Craft Centre in the old Breweries Building. 12h00 Return to the train and depart for Otjiwarongo. 09h30 Transfer to a lodge in Etosha National Park. Enjoy game-viewing activities. Overnight at lodge. The park offers excellent game viewing in one of Africa’s most accessible venues. Zebra and springbok are scattered across the endless horizon while the many waterholes attract endangered black rhino, lion, elephant and large numbers of antelope. Enjoy a morning game drive before checking out and returning to the train. 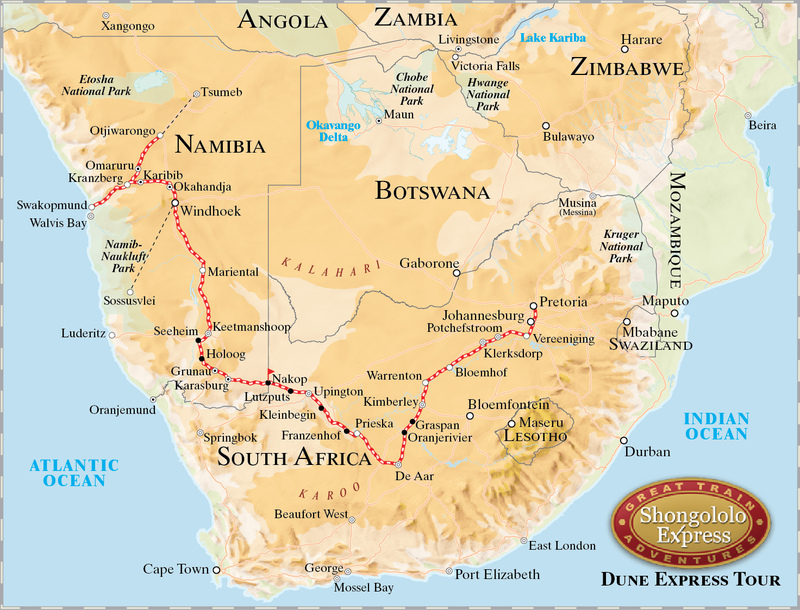 15h00 Rejoin the train in Otjiwarongo and depart for Kranzberg for overnight. 11h30 Arrive at Swakopmund Station where your tour ends. Check out of the train and transfer to hotel. Swakopmund, Namibia’s seaside resort on the west coast, is a place of singular charm. It resembles a small Bavarian village nestling between the desert and the sea and enjoys a restful and relaxing atmosphere. The source of Swakopmund’s continental vibe is the graceful Art Nouveau buildings dating back to the turn of the previous century.